its distinctive black braking parachute streamed. Designed and built in the early 1980s at the Lockheed 'Skunk Works' under conditions of intense secrecy, the F-117A Stealth fighter was not revealed to the public until 1990, after it had been in service for over 7 years. A year later during Operation Desert Storm, laser-guided precision bombing images from the cockpits of Black Jets over downtown Baghdad were on every television screen and newspaper front page around the World. Night after night the theory of an aircraft designed to evade radar detection was tested by brave pilots in combat over densely packed Iraqi radar-directed air defenses. The results, together with the aircraft and its pilots, are now legend. Each copy of BLACKJET is issued complete with historical notes, details of all the signatories, and a signed and numbered certificate of authentication to guarantee that once the edition is sold out, none can ever be reprinted. 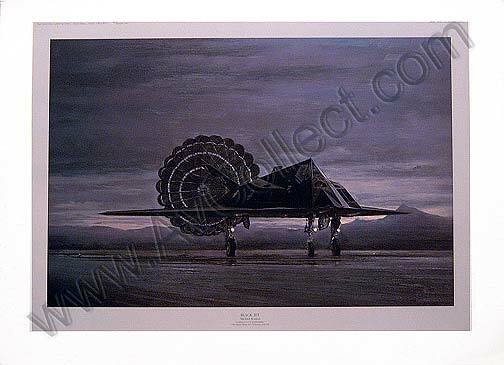 Published as a single limited edition of only 500 copies, this is a truly significant print for collectors of aviation art.